A prototype of Shakir’s project. Solar energy is rapidly gaining popularity as an important means of expanding renewable energy resources. As such it is vital that those in engineering fields understand the technologies associated with this sector. As the non-renewable energy resources are decreasing, use of renewable resources for producing electricity is increasing. Solar panels are becoming more popular. These panels absorb energy from the sun and store it in a battery for utilization when required. Solar panels should absorb energy to the maximum, and this happens when the panels are continuously placed towards the sun. So solar panel must continuously rotate in the direction of the sun to yield significant energy than the stationary panel. Solar energy is clean and abundant. Solar technologies use the sun for the provision of heat, light and electricity. These are for industrial and domestic applications. Societies are massively investing in renewable energy sources. The Sun’s energy potential is immense but the harvesting is a challenge because of the limited efficiency of the array cells. The daily average solar energy incident over India varies from 4 to 7 kWh/m^2 with about 1500-2000 sunshine hours per year (depending upon location), which is far more than current total energy consumption. For example, assuming the efficiency of PV modules were as low as 10 per cent, this would still be a thousand times greater than the domestic electricity demand projected for 2018. The best efficiency of the majority of commercially available solar cells ranges between 10 and 20 per cent. This shows that there is still room for improvement. Solar panels directly convert radiation from the sun into electrical energy. The panels are manufactured from semi-conductor materials, notably silicon. Their efficiency is 24.5 per cent on the higher side. Three ways of increasing the efficiency of the solar panels are through the increase of cell. Maximum power point tracking (MPPT) is the process of maximizing the power output from the solar panel by keeping its operation on the knee point of P-V characteristics. MPPT technology will only offer maximum power when the sun is aligned with the system. Solar Tracking System is the art of making solar power harvesting more efficient. A solar tracker is a device used for orienting a photovoltaic array solar panel or for concentrating solar reflector or lens toward the sun. The position of the sun varies both with seasons and time of day. The sun changes its position with respect to the equator. It shines brightly in summers in Northern Hemisphere and in winters in Southern Hemisphere. The countries on and around the equator do not feel this change too much, but the countries in temperate zones and around the poles experience the harsh winters when the sun shines away from them. Kashmir falls in this category. In Kashmir, the sun does not shine intensely in winters and thus solar panels are unable to harness maximum of the available energy. Solar powered equipment works best when they are pointed at the sun. Therefore, a solar tracker increases the efficiency of such equipment over any fixed position at the cost of additional complexity to the system. Different techniques have been developed for the solar tracking system and one of them is a light-based solar tracking system. Solar tracking is a mechanized system to track the position of the sun to increase power output by 30 to 60 per cent than stationary systems. It is a cost-effective solution than the purchase of solar panels. There are various types of trackers for increasing the harvesting of energy. Dual axis trackers are among the most efficient, though this comes with increased complexity. Dual trackers track sunlight from box axes. They are the best option for places where the position of the sun keeps changing, daily and seasonally. Single axis trackers are a better option for places around the equator where there is no significant change in the apparent position of the sun. The level to which the efficiency is improved will depend on the efficiency of the tracking system and the weather. Very efficient trackers will offer more efficiency because they are able to track the sun with more precision. Increase in efficiency is better at places where the weather is sunny. 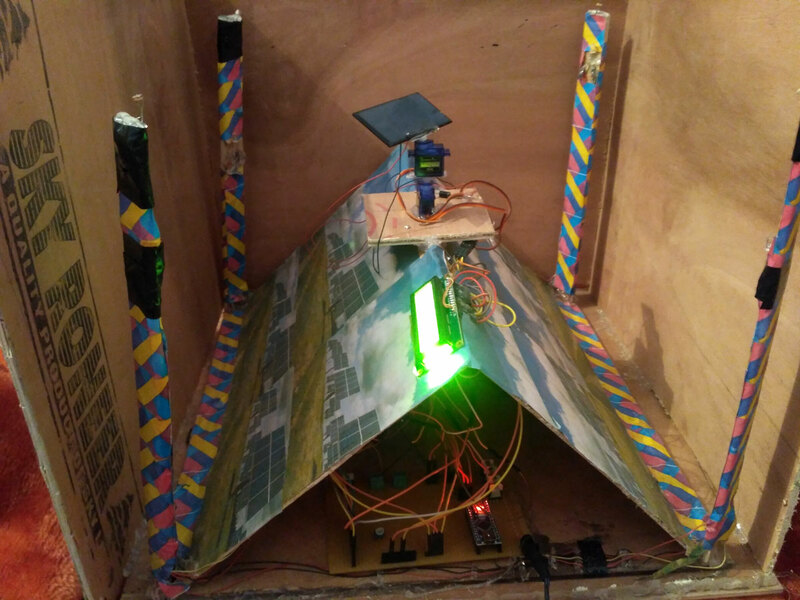 Sun-synchronous navigation is related to moving the solar power robot in such a way that its solar panel always points towards the sun and which results into maximum battery charging and hence the robot can work for long hours. The unique feature of this system is that instead of taking the earth as its reference, it takes the sun as the guiding source. Its active sensors constantly monitor the sunlight and rotate the panel towards the direction where the intensity of sunlight is more. The light dependent resistors (LDR) do the job of sensing the change in position of the sun. The control circuit does the job of fetching the input from the sensor and gives the command to the motor to run in order to tackle the change in position of the sun. By using this system the additional energy generated is up to 30 per cent with very less consumption by the system itself. The project describes the use of a microcontroller based design methodology of an automatic solar tracker. LDR is used as the sensors of the solar tracker. The tracking system maximizes solar cell output by positioning a solar panel at the point of maximum light intensity. This write-up details the use of DC motors, special motors like stepper motors, servo motors, real-time actuators, to operate moving parts of the solar tracker. The two light sensors (LDR) are used to track the sun and to start 24x 7 operation. The LDRs when exposed to light show zero resistance. The microcontroller makes the servo motor to rotate in the direction from where the lowest resistance is reported i.e. where the brightness is the most. The rotation of servo motor, in turn, rotates the solar panel and thus harnesses the maximum energy available. This system is expected to save more than 40 per cent of the total energy of the panels by keeping the panel’s face perpendicular to the sun. DC motor is used to adjust the attitude of the solar panel. Sensor control is that sunray is detected by a photoelectric detector and then the changed signal is transmitted to control motor to adjust the altitude of the solar.